Charger controllers C8502, for two wind turbines. 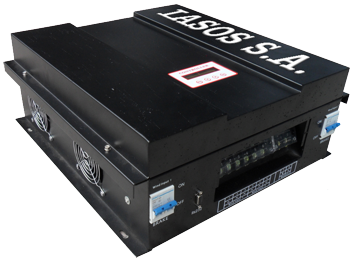 Produced by the company "IASOS S.A."
Applicable to different kinds of batteries. making the battery charging in best status. Digital intelligent control, With powerful imported MCU control as the core device .To ensure Simple peripheral circuit Structure, and more flexible and powerful control method and control strategy. Modular design with simple structure and easy maintenance. This kind of wind controller is special design for off-grid wind generation system. Appearance is elegant, operations are easy. It also makes the course wind generator charge to batteries safely and efficiently. The choice of operating voltage, is done automatically by the controller. The controller recognizes the battery voltage and selects operation in either 12 dcv or 24 dcv or 48 dcv. 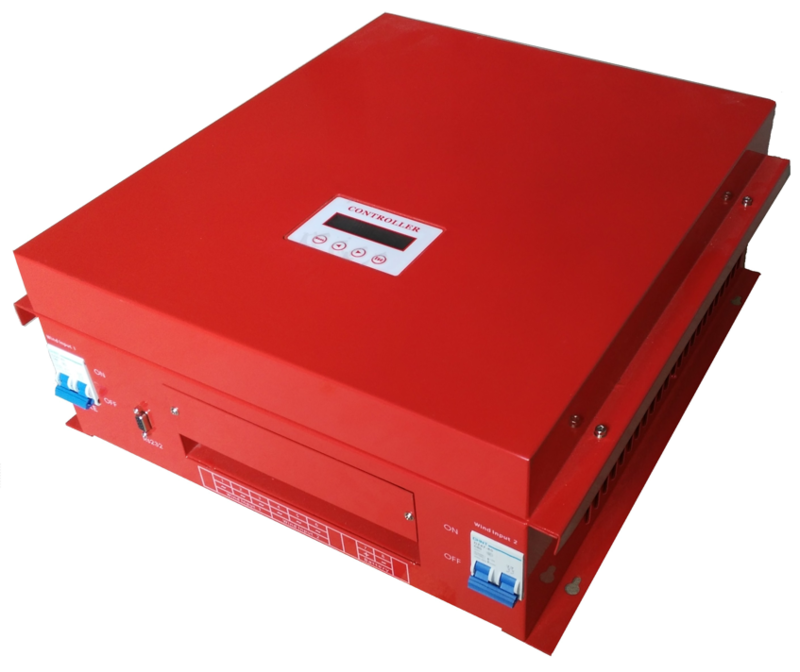 Perfect protection function: Battery overcharge protection, Battery over current protection, Battery reverse connection protection, Open battery protection ,Wind turbine automatic brake and manual brake, thus the system has higher reliability. PARAMETERS, WHEN THE CONTROLLER OPERATES WITH 12 DCV BATTERIES. It depends on what model generator use. Dump load control mode: Over rotate speed limiting, Over voltage limiting, Over Current limiting, PWM. Display content: Battery: Voltage, charging current, Percentage of battery power. Wind: Voltage, charging current, rotate speed, output current, output power. Operating temperature & Relative humidity: - 20 C° ~ +55 C° / 35 ~ 85 % RH (Non-condensing). 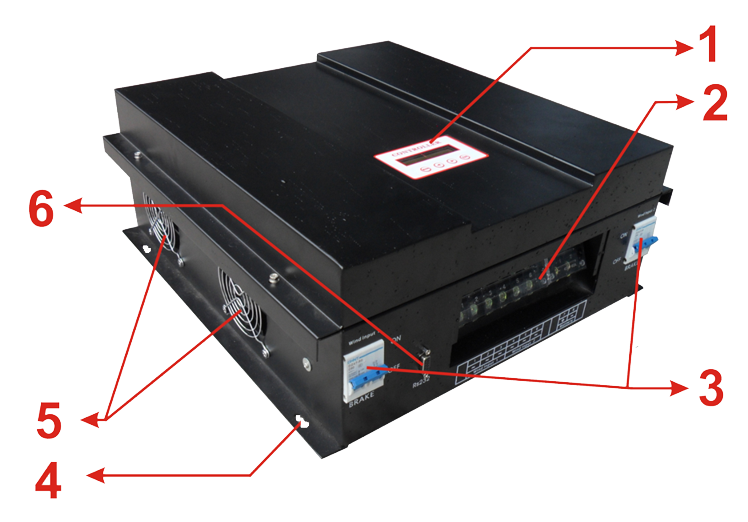 Protection type: Battery: Over-discharge protection, over-charge protection, anti-reverse connection, outside switch. Wind: Over rotate speed protection, over voltage protection, over current protection. PARAMETERS, WHEN THE CONTROLLER OPERATES WITH 24 DCV BATTERIES. PARAMETERS, WHEN THE CONTROLLER OPERATES WITH 48 DCV BATTERIES. System: State, generated energy, error code. 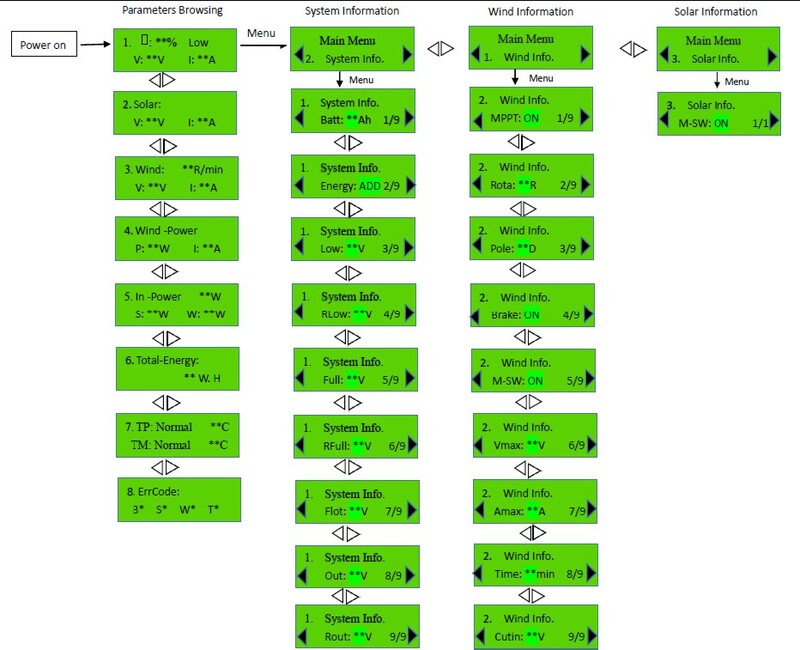 Wherever referred solar, suggests the second input to controller connection, which can be used also for solar connection. Wind Turbine and Load Adaptive Impedance Matching, maximize energy utilization. There is internal resistance in Wind generators, batteries and loads. According to impedance matching principle, only when input impedance equals to output impedance, power utilization is maximal, get the maximum power. Protect wind generator from over-revolution speed, over-voltage and over-current. Max revolution speed, max voltage and max current of wind generator could be set. 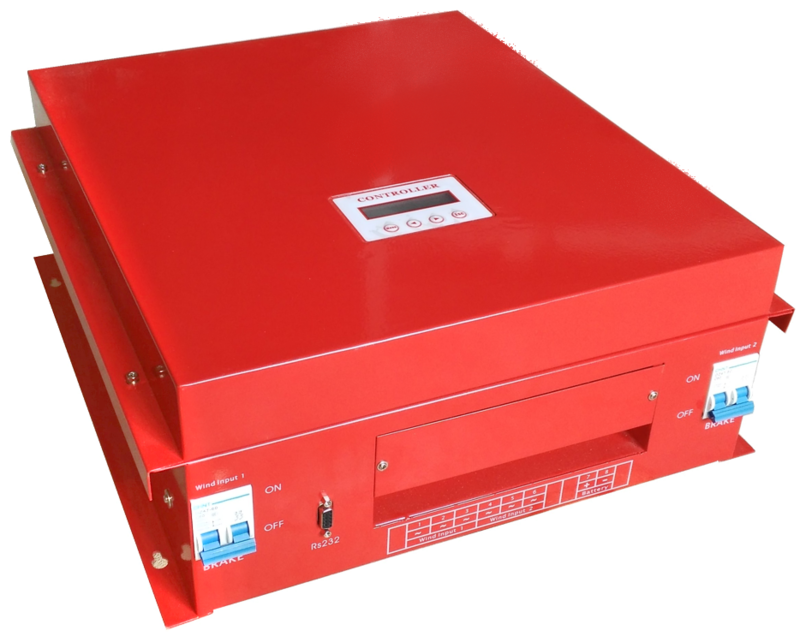 Once the actual revolution speed, voltage or current over the set ones, PWM intelligent unloading will start automatically. That protect wind generator. Intelligent limiting of batteries max current. Batteries maximum capacity could be set through this controller. According to the set maximum capacity, controller could calculate the maximum charging current. Then batteries will be protected. On the controller you can manually set whether using wind charge to battery. BOOST and BUCK function in one. 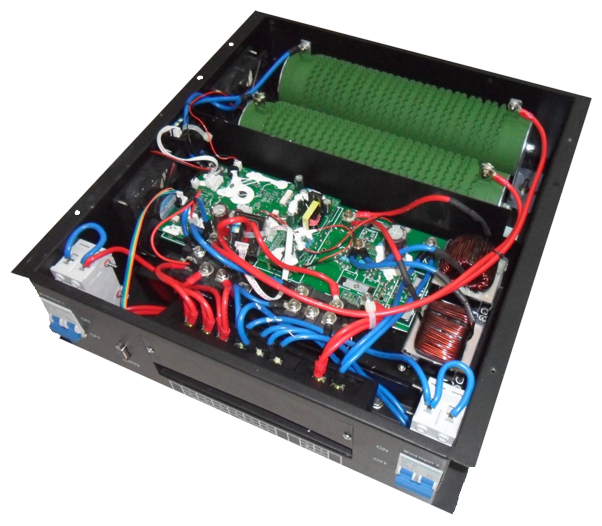 Once wind generator voltage is lower than battery voltage, controller starts boost module automatically. Wind generator voltage is increased to the charging voltage, and it is boost charging. When wind generator voltage is higher than battery voltage, in order to acquire max power, buck module of controller will be started, the generator is buck charging. 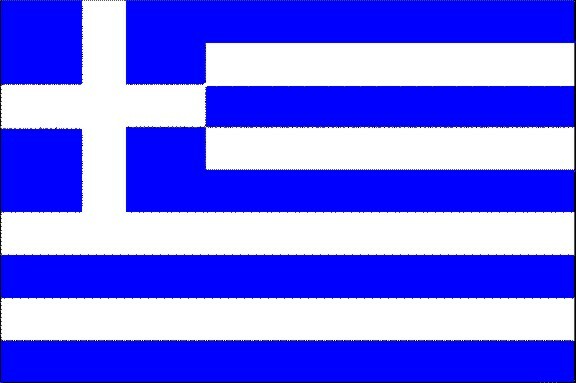 Loads lower the revolution speed of wind generator, when it is breeze. That decreases the output power of wind generator. Through max current tracking (MCT) and max power point tracking (MPPT), output of wind generator is stabilized at the max balance of wind energy utilization. Combine with boost and buck function, wind energy utilization is increased. By serial interface communication, you could monitor the whole system, storage and analyze data. Program could be upgraded by serial interface. Connect PC and controller by serial interface. You could set the parameters on PC and controller simultaneously. Software is free, easy to operate and no need to be installed. A friendly human-computer interaction interface. Running data and configuration parameters are displayed in the LCD screen. Parameters could be set by keys on the panel. Connect wind generator, pv panel, battery and load. Resistance cooling fan and System cooling fan. This fan rotates when wind generator braking ,cooling the resistances. This fan rotates when charging current is too high, cooling the system. Read through this entire section first before beginning installation. All mounting work must only be performed by professional personnel. Disconnect all sources of power to the controller before installing or adjusting. Do not allow water and snows enter the controller. Install in locations where is dustless, airy and avoid direct sunlight. If install controller in a cabinet, make sure there is enough space for controller heat-dissipating. Keep controller away from corrosive gas and intense electromagnetic interference. Locate the product in where easy to install, electrical connection and service. Choose mounting location. (Please refer to installation notes). Check for clearance around the location; make sure there is enough space for connecting cables. Place the controller to the mounting location. Check that the controller is securely mounted. Improper operation during the wiring process can cause fatal injury to the operator or unrecoverable controller damage. Only qualified personnel can perform the wiring work. All cables must be undamaged, properly insulated and adequately dimensioned. Make sure that all cables are firmly attached. Unsecured cables create loose and resistive connections which may lead to excessive heating and /or fire. For mobile applications, be sure to secure all wiring, avoid loose connections. Wiring Steps (Follow the bellow suggestions and steps to connect). 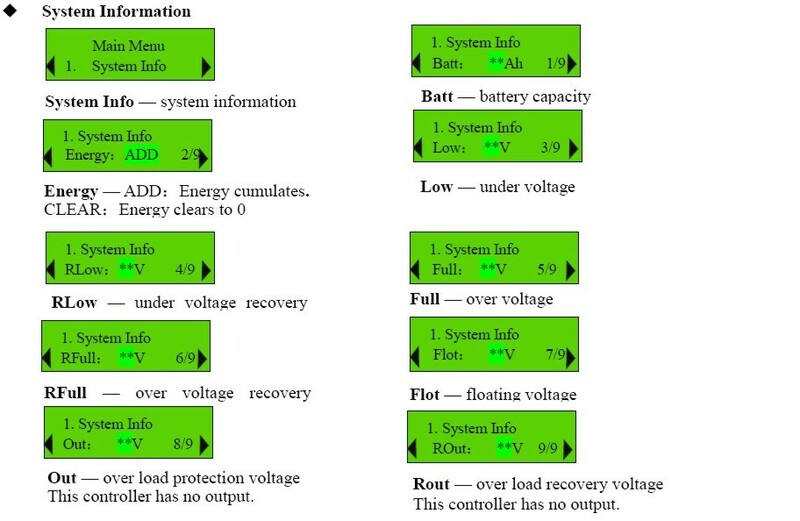 Connect battery positive(+) and negative(-) wires to controller as shown in figure 2.2.3.1. Be careful of avoiding short circuit when wiring the battery. Before wiring the battery, keep the battery switch of controller (BATTERY) on OFF, Do not switch it to ON untill you confirm the wiring is correct and safe. Although controller has the protection of battery anti-reverse, but anti-connecting of positive (+) and negative(-) is forbidden. 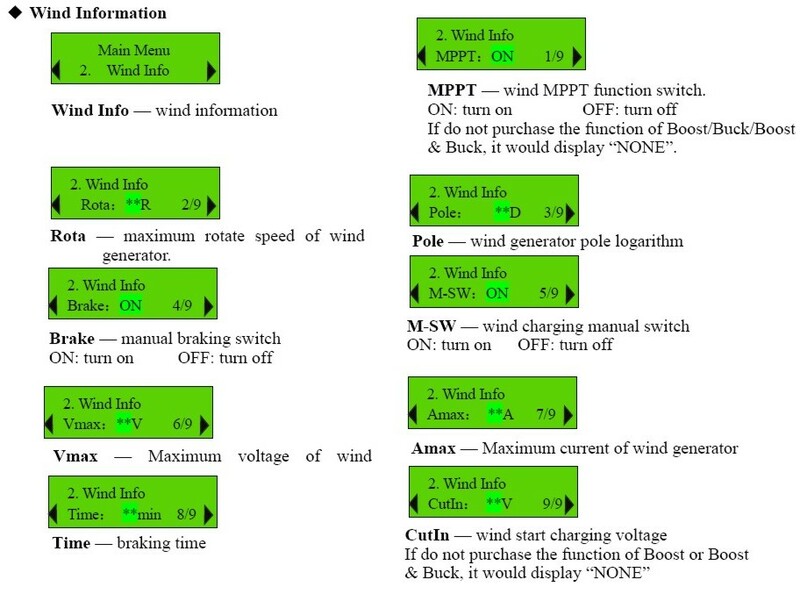 Connect wind generator wires to controller as shown in figure 2.2.3.1. The wind generator could produce high voltages. Be careful of electric shock. When it is breeze or windless, connection of wind generator and controller would be safer and better. Only when controller is in the state of start-up, high-speed rotate wind generator could be connected. Double-check the wiring. Make sure each connection is correct. Secure no loose and resistive connections. The gray shaded parameters could be set manually by users. Press Menu to enter the setting state, setting value would flash. Press "  to decrease the setting value. Press   to increase the setting value. After step 2, press Menu to save the setting, press Esc to back out. W2: **Swhen battery voltage is greater than Full, generator is braking. Exit braking Time countdown. W3: **Swhen rotate speed of wind generator is greater than Rota, generator is braking. Exit braking Time countdown. W4: **Swhen wind generator voltage is greater than Vmax, generator is braking. Exit braking Time countdown. W5: **Swhen wind generator current is greater than Amax, generator is braking. Exit braking Time countdown. 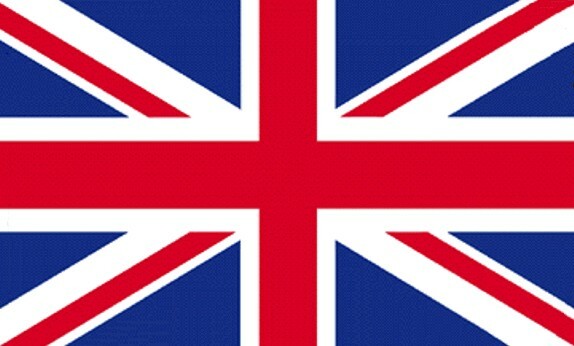 W* :StayExit braking Time countdown finish, wind generator still stay brake. Full. It should be set in step 5/9 settings "System information". Rota. It should be set in step 2/9 settings "Wind information". Vmax. It should be set in step 6/9 settings "Wind information". Amax. It should be set in step 7/9 settings "Wind information". Time. It should be set in step 8/9 settings "Wind information". This value is cumulative. If want to start from 0, set "ENER" in step 2/9 settings "Wind information". Error: Temperature detection module is error. S1solar input voltage is high. S2solar charging module short-circuit fault. S3solar charging module open-circuit fault. W1wind generator is manually braked. W2battery voltage is greater than Full, wind generator brakes. W3wind generator rotate speed is greater than Rota, generator brakes. W4wind generator voltage is higher than Vmax, generator brakes. W5wind generator current is greater than Amax, generator brakes. W7wind charging module short-circuit fault. W8wind charging module open-circuit fault. W9wind input voltage is high. T1MOS fet detection module fault. T5controller device detection module fault. 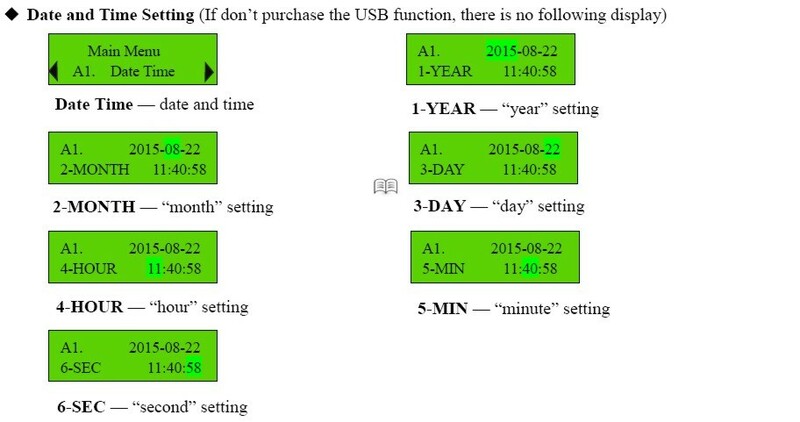 USB (This is optional function, if not purchase, there is no the following display).